If your business has anything to do with ecommerce, transactions, products or purchases, this one’s for you. Cart abandons are as the name suggests, a record of how many users / customers leave a website without making a purchase after they reach the checkout page. Business Insider says that products worth approximately $4 trillion are abandoned in online shopping carts. There’s more. 63% of that is actually recoverable! In this article, we’ll take a look at the reasons for cart abandons, a quick overview of the setup & some case studies on how tracking abandons has helped businesses. Tracking this can throw light on some valuable information like why your customers are abandoning their carts and what you can do to rectify this to increase purchases. 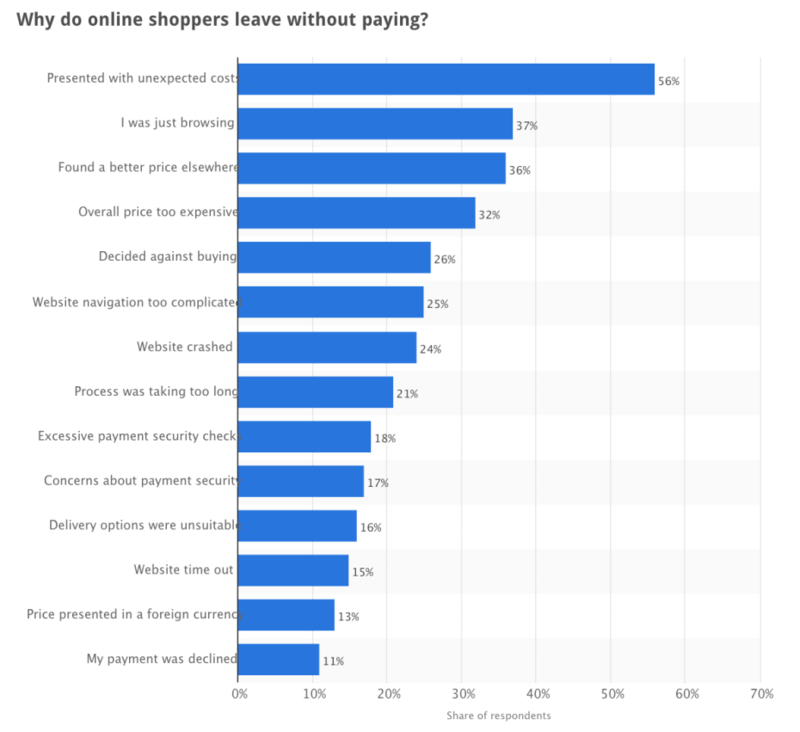 A survey of online shoppers conducted by Statista uncovered some reasons why shoppers dropout at checkout. If your customers are leaving your website without making a purchase, it could be one of these reasons or a combination of more than one reason. Lucky for us, the guesswork can stop. 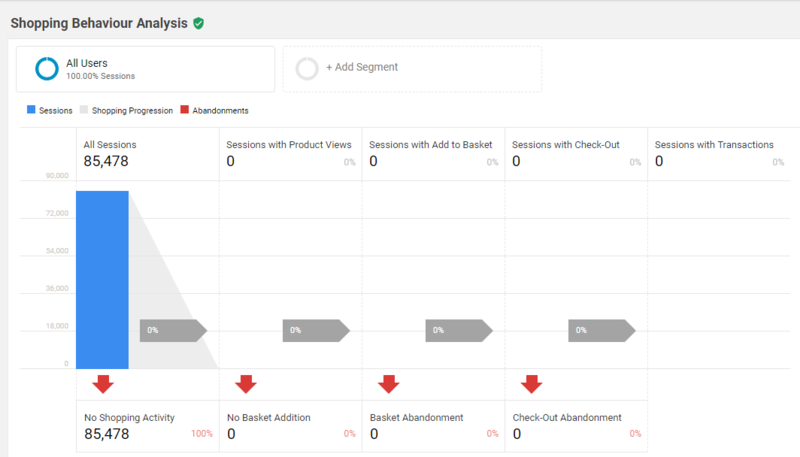 Checkout funnels in Google Analytics can help put a finger on the issue by letting you know at what stage your customer abandoned her/his cart. So let’s get straight to how to create these funnels in Analytics. The new analytics has made it super easy to set up cart abandon tracking. Analytics gives you a customizable view of your customers’ shopping behaviour. You can use each segment to market to differently. For example, for a customer who drops out before the checkout, you can run a campaign to give him an additional 20% off to win her/him back. You can alternatively set up a goal to track the same with a URL like /payment-success.php. However, this is a longer process to setup. E-commerce conversion does the same in a single step. Although, e-commerce tracking is flaky & it’s probably better to set up your own ecommerce tracking using events tracking. 1) LaTiend an online food retailer from Spain, found that customers were abandoning their carts. To test if shipping costs played a part in the cart abandons, they carried out an experiment. They created a funnel in Analytics and segmented visitors based on geographic locations. (You will be able to find this under ‘Location’ reports in ‘Audience’.) They were able to see how people from various geographies convert in their funnel. LaTiend noticed that those from region B abandoned their carts 48% more than those from region A. Region A was close to their warehouse while region B was further away which meant that shipping costs for region B were higher & therefore customers who lived there tended to abandon their carts more. To further test their hypothesis, LaTiend then introduced flat shipping rates across regions. They saw a conversion increase of a whooping 70%! As shown by the above case studies, tracking cart abandons can significantly improve conversions and as a result, improve business. There is still one other thing you can do to completely prevent cart abandons, a Reward Program. This could work as your biggest asset. A reward program could work to turn surprise costs into surprise discounts that will guarantee conversions. Reward programs such as welcome points, free credits, shopping credits, free shipping etc. can give your customers incentive to shop, use those credits & therefore reduce cart abandons! Try it & let us know how this works for you. Also, if there is anything else you’d like me to cover under the Getting the Most out of Google Analytics series, let me know in the comments section below.